The scientists on RRS Discovery work all hours. The ship is expensive to run and the Shelf Seas Biogeochemistry (SSB) Project has a lot of different tasks to achieve and it would not be possible to do this without working 24 hours a day. What this means is that a small fraction of the scientists and crew on board need to adjust to working during the night. The shift that I have been allocated runs from 6 pm to 6 am. Getting into the swing of it is hard as your body clock adjusts but this is the third cruise in this project where I have been asked to work the night shift so I am getting used to it. There are a few downsides: we miss all lunches and most breakfasts (although food is left out for us), we don’t see that much sunlight, and everyone’s day finishes as ours begins but there are lots of positives. 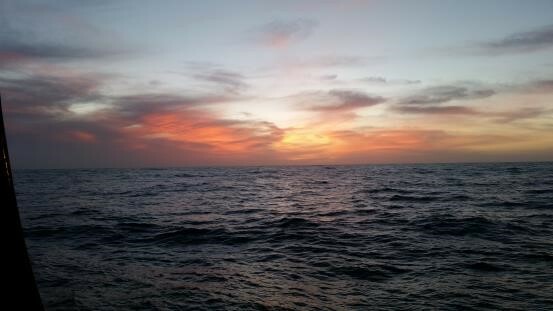 Sunsets at sea are spectacular things. The air is clear, the sky turns multi-coloured and the light reflects off the clouds. A lot of the larger creatures like the cover of darkness. So far on this cruise we’ve seen two different types of shark, a sunfish, dolphins, a whale, garfish and many jellyfish. A lot of the fauna get attracted to the lights on the boat that shine on the water while we are working. This means that as they approach the boat they are easy to spot. We regularly watch dolphins play around our sediment corer as it hits the water. The controlled temperature laboratory we use on board is possibly the busiest part of the ship. It is a small lab in the middle of the ship where we keep the sediment we collect that is kept at the same temperature as the bottom of the sea. There are ten people working in there and bench and floor space is very limited. All the space that will be used is planned out months in advance but when lots of people are working in there it can become very cramped. During the night shift the majority of those who use the lab are asleep so we get the chance to work knowing we won’t be in anyone’s way. Because there are so few people working at night we all help to collect each other’s samples. Over the three cruises I have had the chance to trawl for epibenthic megafauna (looking for large rarer invertebrates that live on the sediment surface), use a sediment profile imager (SPI) to make cross section images of the sediment water interface and helped deploy a large in situ flume (a device that sits on the seabed and creates a current that runs in a circle to look at how the mud and sand behave under different conditions). The kitchen does not run 24 hours, so when we work nights there is no lunch put on. We eat dinner for breakfast and breakfast for dinner. You can get lunch put aside but sometimes it’s more fun to create snacks from the leftovers of dinner, toast and buffet bar. Salad mountains, rum and raisin ice-cream granola, peanut butter, jam, banana and nutella sandwiches, potato salad baps, and anything you fancy. The sunrises are as spectacular as the sunsets, with the added knowledge that the nights work is almost over and it’s nearly time for bed as everyone else gets up. Collecting images from the seafloor.